A quiet start to the year for the EUR/RON as the pair traded in its usual 40-50pips closing just above 4.6600. Not a lot is expected from today’s session, as the market is probably in a wait-and-see mood ahead of the National Bank of Romania's 8 January rate-setting meeting. 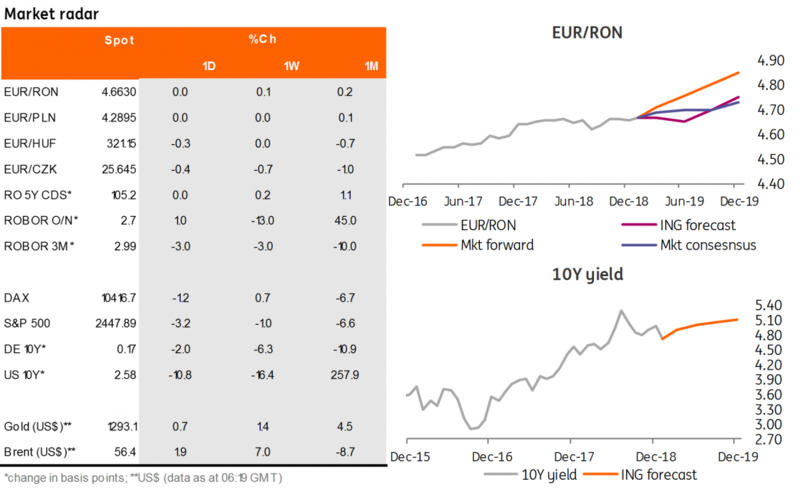 Romanian government bonds rallied yesterday in a bull flattening move, albeit the c.13-15 basis points drop in longer-term bond yields occurred more on low market depth rather than high volumes. The price action seems correlated with regional markets which followed a similar trend. This could come as a result of increased expectations of delayed policy tightening in the eurozone and lower inflation expectations across the central and eastern European space, while country-specific issues overlooked for now. Money market rates dropped across the curve yesterday, in line with our call for better liquidity conditions. The move could continue into the next few days as well with the key rate likely in sight for the funding rates.